Inder Loves Folk Art: Geranium in Bloom. It recently came to my attention that my niece Helen has mostly outgrown all of her auntie-mades. She is a string bean - skinny but very tall for her age. She is also turning three in a couple of weeks. And she likes to wear dresses. Girls this age are really fun to sew for! So I've been on a little bit of a Helen sewing kick. I decided to make the birthday girl a party dress. Anyway, I opted for the cap sleeve, pleats (there are in-seam pockets!) and plain neckline. The bodice is lined in muslin. 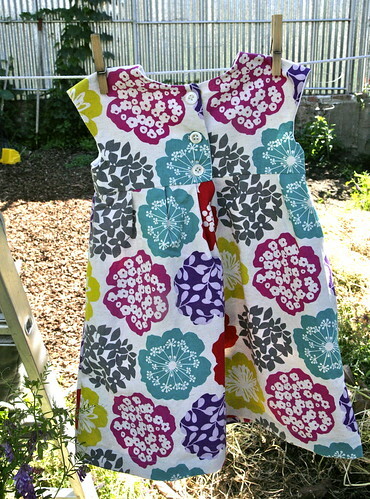 And yes, the fabric is Echino "Bloom." (Geranium in Bloom! Get it? Hehehe. I am so clever!) I bought it to make something for myself, but is so ... loud. I love it, but I couldn't quite wrap my head around actually wearing something this bright. So it's funny that now that I've sewn this dress up for Helen, I keep thinking, "I would totally wear this dress!" Haha. So it goes. I often buy fabric with one idea in mind, only to have second thoughts about its intended purpose. So the fabric sits in the stash for a while ... later, inspiration hits, and it's used for something very different! The end result is that I can feel smug and virtuous about using "stash" fabric instead of new fabric, ha. Because fabrics that sit unused in my piles for more than a year become free, didn't you know? In other news, our garden is wild and wonderful this year. The tomatoes are flowering, the greens are ready to make salad, and there are so many honeybees you can hear them buzzing around the borage from across the garden! 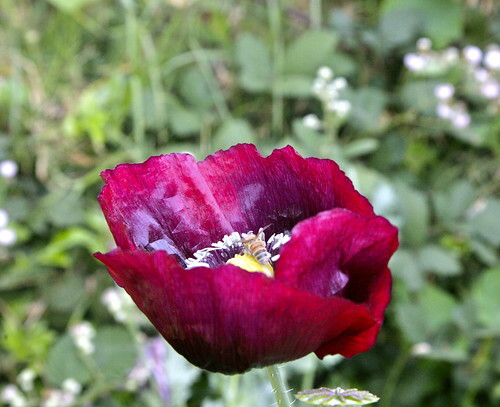 Check out our poppy patch! Some of these plants are over six feet tall! I love bees. When the children are a little older, I really want to keep my own hives. I may get chickens too. 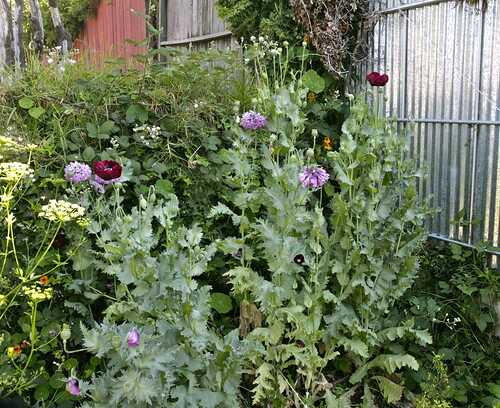 For now, two dogs and two kids are enough work, but I try to grow lots of bee-friendly flowers. 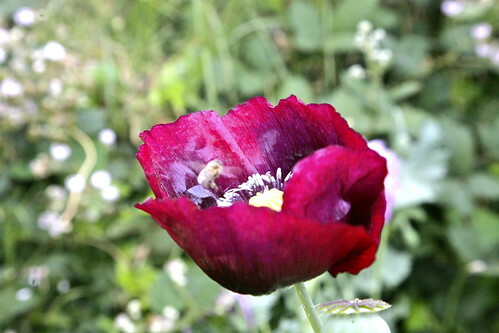 I love to see honeybees and bumble bees rolling around delightedly in a poppy flower. It seems like a good life, being a bee. As Joe says, "The bees are my friends! But I don't touch the bees." That's right, Joe. Some friends need their personal space. 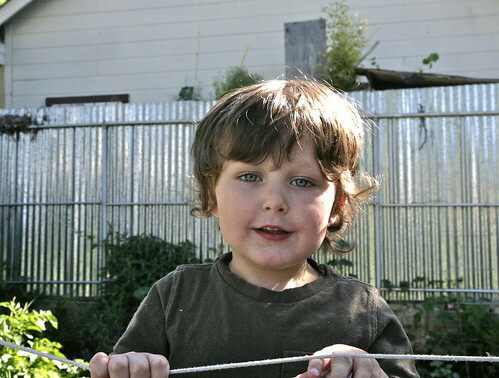 And here's farmer Joe, helping mama with the clothesline. He really is a looker, isn't he? You are seriously not doing my pattern addition/need any favors! Too cute! I need to slow down and take time to make some dresses for the girls but I still have a to do pile a mile high! Love the fabric, too. Oh, and stash fabric is free. Just like birthday cake on your birthday has no calories. It's a rule. Seriously. I saw it in the mommy handbook! I'm not going to be any help with your pattern addiction/need, because I've been on a pattern bender lately! And there are still so many more that I want! what a lucky girl! such a beautiful dress! Thank you! I think she's going to love it. Especially the pockets! Cute, cute dress! And of course you're getting practise in so you can churn out heaps of Geraniums for Maggie when she's big enough. That fabric would look great in a Washi Dress for you! 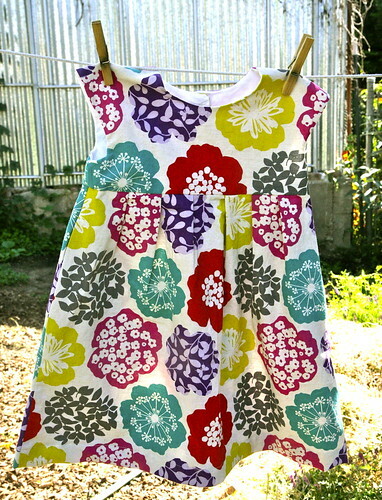 Indeed, I may make Maggie a Geranium (top, since longer dresses get in the way of crawling) sooner rather than later! Dang it, I don't think I have enough left for a Washi (which I haven't bought, because it's not the most nursing friendly pattern), but I might have enough for a skirt ... hrrrmmmm. That dress is just so beautiful! 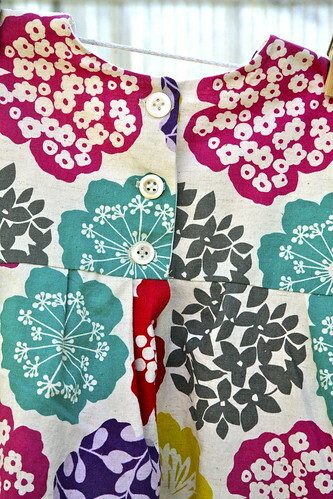 The larger print works perfect on the geranium dress! Your niece is going to look adorable in it! Yes, I was looking around in the stash for dress fabric, and this just jumped out at me. I never would have considered it for little kid's clothing before, but I love the final result. Inspiration! Joe is definitely a looker. And that dress is so lovely -- I like how a simple pattern can bring out the beauty of a fabric. A perfect match!